2 Edinburgh Crystal Thistle Cut Champagne Flutes, Mint! 2 Edinburgh Crystal Thistle Cut Champagne Flutes in excellent unused condition! No longer made, this model has been produced since 1920. 1 Edinburgh Crystal Thistle Cut Champagne Flute, Excellent! No longer made, this model has been produced since 1920. The flute has a thin bevel stem and is acid etched on the base "Edinburgh Scotland" indicating that it is first quality and produced after 1980. These glasses are UNsigned. Price DOES NOT include duty. 1 Edinburgh Crystal Thistle Cut 3" Whisky Tumbler, Excellent! No longer made, production of this model began in the 1920s. It is marked on the base "Made in Edinburgh Scotland" indicating that it is first quality and likely produced between 1955 and 1980. SET OF 2 OLD STYLE EDINBURGH CRYSTAL THISTLE CUT & ETCHED. Each goblet is shaped like a thistle and etched with flowers and leaves. Gorgeous and hard to find Edinburgh Crystal double old fashioned glasses in the Thistle pattern. Approx 3 3/4" tall and 3 1/4" wide across the top. The sides of the glass are straight up and down although my photo makes them look a bit slanted. SET OF 6 OLD STYLE EDINBURGH CRYSTAL THISTLE CUT & ETCHED. Each goblet is shaped like a thistle and etched with flowers and leaves. Large wine decanter cut and blown in Edinburgh Crystal factory in Edinburgh in the 1980s. This is part of a family collection that was seldom used but displayed behind glass doors. Excellent condition, no scratches or nics. Crafted in Scotland, England. Blown Glass. 2 Edinburgh Crystal Thistle Cut Large Old Fashioned Tumblers, Excellent! Rare Edinburgh Crystal Thistle Cut Large Old Fashioned Tumblers in mint condition. No longer made. No sign of use and quite beautiful! 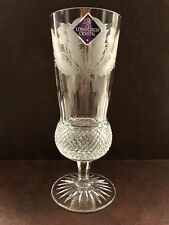 Edinburgh Crystal Thistle Cut Wine Decanter 12", Excellent! From the Edinburgh Crystal Thistle Cut Collection, a Wine Decanter in Excellent Condition. The decanter is marked on the base "Made in Edinburgh Scotland" indicating that it is first quality and likely produced between 1955 and 1980. THISTLE PATTERN. (THIS IS AN OLDER ONE AS THE THISTLE PATTERN. LARGE WINE DECANTER. CUT CRYSTAL. IS CUT AND NOT JUST ETCHED). do our "Very Best" to insure your. Glass is in excellent lightly used condition. 3-1/2oz capacity. Up for sale is EDINBURGH THISTLE CRYSTAL SET OF 6 CORDIAL GLASSES. The pattern features superior intricate detail! This set is in EXCELLENT CONDITION and would serve as a priceless gift or as a fantastic addition to your own collection! I believe it is considered a hock wine, but I am not positive of its classification within the "Thistle" pattern. Made in Edinburgh Scotland is acid etched on the bottom. It is in very good, crystal clear condition. Edinburgh Crystal Thistle Cut 10.5" Square Whisky Decanter, Perfect!! Very rare, Edinburgh Crystal Thistle Cut Square Whisky Decanter in excellent unused condition. It is marked on the base "Edinburgh Scotland" indicating that it is first quality and produced after 1980. Price DOES NOT include duty. These glasses are signed. Decanter is 7 3/4" Hwith Stopper 5 3/4" H without Stopper. Edinburgh Crystal Thistle Old Fashioned Tumbler 4"
For sale is a Edinburgh Thistle old fashioned tumbler. Signed on base. Use pictures for condition. Price DOES NOT include duty. This glass is signed. Price DOES NOT include duty. Gently used and cared for, displayed in china cabinet. I could not find any etching on the base, probably because it is such a small area, but it is clearly the popular Edinburgh pattern. Piece: Water Goblet. Pattern: THISTLE (CUT). Manufacturer: Edinburgh. Canadian and international orders. U.S. Expedited. Decanter is 10 3/4" Hwith Stopper 4" Square 7 1/8" H without Stopper. This piece is signed and does not appear to have been used! Set of 4 Edinburgh cordials. Signed "MADE IN Edinburgh SCOTLAND". Beautiful crystal glass scotch whisky tumbler is thistle-shaped itself, with bulbous diamond hex base, panel cut neck, and flared top rim with etched thistle and leaves design. Gorgeous and very hard to find Edinburgh Crystal finger bowls in the Thistle pattern. Etched thistles around the rim and lightly etched "Made in Edinburgh, Scotland" mark on the base. EXCELLENT Condition. This jar is signed. Price DOES NOT include duty. Edinburgh Crystal Etched Glass THISTLE Cut Champagne Flute/ Water Goblet 6 7/8"
Edinburgh Crystal Thistle Cut Champagne Flute / Water Goblet in excellent unused condition! I have two of this size glass available but they do have different stem designs. These glasses are UNsigned. These glasses are second quality and have factory flaws such as bubble and extra cuts. Price DOES NOT include duty. RARE OLD EDINBURGH SCOTLAND SIGNED THISTLE CUT LEAD CRYSTAL ART GLASS BOWL 8" !! Up for your consideration is a GORGEOUS rare / desirable antique / old lead cut crystal thistle bowl / centerpiece handcrafted by well known high quality maker EDINBURGH of Scotland! Bowl has unique cut crystal motifs throughout! Edinburgh Crystal THISTLE Etched Finger Bowl(s) Rare! Gorgeous Edinburgh Crystal finger bowls in the Thistle pattern. Etched thistles around the rim and lightly etched "Made in Edinburgh, Scotland" mark on the base. EXCELLENT Condition. Price is for one bowl and I do have extras available if needed. I have 6 claret wines available. 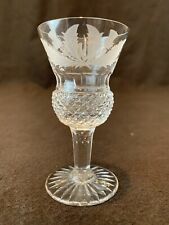 Nice clear cut crystal claret wine glass in the Thistle pattern by Edinburgh. Older unsigned version that originally had a sticker. Edinburgh Crystal Thistle, Peach Melba with Bulbous Stem, 3-3/4"x 4-1/4"
Beautiful pieces, excellent condition. Discoloration in photo is reflection of light and not a flaw in the crystal pieces. A versatile addition to collection.